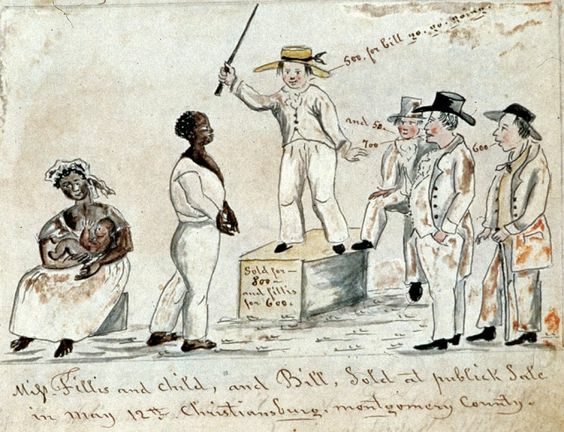 “Slave Auction in Christianburg, Virginia. From Lewis Miller, Sketchbook of Landscapes in the State of Virginia, 1853-67. In mid-January, freshman Delegate Jason Miyares, a Republican representing Virginia Beach, and the first Cuban-American elected to the Virginia Assembly, introduced House Resolution 297, Recognizing the Influence of Christian Heritage in Virginia. Taking liberties with the historical record, H.R. 297 presents an abridged, greatest-hits version of Virginia’s Christian history, focusing on the arrival of the Jamestown expedition in April 1607, followed by the alleged baptism of Pocahontas a few years later, and then jumping to the civil rights era. Del. Mark Cole (R-Fredericksburg), a member of the Virginia Assembly since 2002, co-sponsored the Christian Heritage resolution, though he did not play a role in drafting it and had little to say about its inception. But just who are these constituents? Del. Cole has long championed legislation sensitive to the attitudes of conservative fundamentalist Christians. In 2010, he sponsored a bill, which his Senate colleagues later dismissed as “a solution looking for a problem,” to prevent employers and insurance companies from requiring their customers or employees to implant microchips inside their bodies for rapid data collection. "My understanding—I'm not a theologian—but there's a prophecy in the Bible that says you'll have to receive a mark, or you can neither buy nor sell things in end times. Some people think these computer chips might be that mark,” Cole explained to The Washington Post. According to Del. Miyares, Rodney Walker, President of First-Landing Festivals, a Christian organization that stages a theatrical reenactment of the arrival of the Jamestown expedition at Virginia Beach’s First Landing State Park, asked him to introduce the Christian Heritage resolution on the festival’s behalf. The Virginia Assembly’s passage of the Christian Heritage resolution offers legislative endorsement of the First Landing Festival and legitimizes Walker’s fundamentalist Christian version of history. H.R. 297 will also help to ensure that Walker’s reenactment continues to receive voluntary financial support from Christian groups. Last year, the Christian Broadcasting Network donated $5,000 to Walker’s organization to help cover the cost of the First Landing Festival. In November 2016, Walker created a GoFundMe page to raise $5,100 for this year’s reenactment but has not yet received any pledges of financial support. Although Walker composed the bulk of the resolution, Del. Miyares said he decided to add several passages underscoring the influence of Judeo-Christian principles on Western civilization and American legal and intellectual traditions, particularly the civil rights movement. He saw no need to consult independent experts when drafting the resolution. “Clearly Christianity has influenced Americans and American history. Of course it did. It would be denying history to argue otherwise,” he stated bluntly. Del. Miyares believes that offering official recognition of the influence of Christianity in Virginia or the nation as a whole is simply a matter of acknowledging the historical record. “The House not only passed H.R. 297 last month, it also passed Joint Resolution 573, designating January 18, 2018 Pongol Day in honor of a Hindu religious festival. What happened in Virginia is echoed across the nation. Take Congressman J. Randy Forbes, who introduced House Resolution 397, America's Spiritual Heritage Resolution, in the U.S. House of Representatives in 2009, “affirming the rich spiritual and religious history of our Nation's founding and subsequent history.” “While America has always welcomed individuals of diverse faiths and nonfaith, we have never ceased to be a Judeo-Christian nation,” Rep. Forbes wrote in a US News op-ed in 2009. And then there’s Donald Trump, whose statements and actions—both as President and as a political candidate—make plain his embrace of the notion that America is now and has always been a Christian nation. He favors “extreme vetting” for visitors and refugees from predominantly Muslim countries and an immigration policy that prioritizes Christian refugees. At the behest of conservative Christian leaders, Trump is also threatening to “totally destroy” the Johnson Amendment, set in place over sixty years ago to restrict tax-exempt organizations, such as churches, from openly supporting candidates for political office. But there are legislators at the state and federal level who strongly disagree with the Republican consensus on this question. Del. Price also pointed out that, while she can’t speak for her colleagues, no African American delegates voted in favor of the Christian Heritage resolution. Other Virginia delegates who voted no on H.R. 297 echoed Price’s concerns. And what do historians make of H.R. 297? Manisha Sinha, Draper Professor of Early American History at the University of Connecticut, expressed concern that Virginia’s Christian Heritage resolution avoids addressing the “long and complicated” relationship between slavery and Christianity. Perhaps that explains why the less savory aspects of Virginia’s Christian heritage—slavery, the Civil War, reconstruction, Jim Crow—were left out in favor of more feel-good history, such as the supposed conversion of Pocahontas to Christianity. But even H.R. 297’s account of Pocahontas’s baptism is not without serious flaws. Legislation that invokes historical Native Americans but does not involve contemporary American Indians in the conversation offers stark evidence of the pervasiveness of assumptions that Native peoples have vanished. When asked about the Christian Heritage resolution, chief Robert Gray of Virginia’s Pamunkey Indian Tribe—the modern-day descendants of Pocahontas—said that the Pamunkey were not consulted. They hadn’t even heard of the resolution. But chief Gray didn’t seem surprised to learn that Virginia legislators were appropriating Pocahontas for their own ends. Her symbolic importance in English and American narratives has always outstripped her more modest role in tribal history. While Del. Miyares is correct to assert that Christian beliefs and practices played a key role in Virginia’s history, the exact nature of that role remains open to interpretation and discussion, as does the influence of Christianity in modern America. He nonetheless reiterated his support for legislative acknowledgment of the importance of Christian heritage in Virginia and throughout the nation.